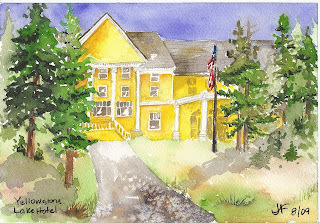 While we were staying at the cabins adjacent to the Lake Yellowstone Hotel, I managed a long morning of painting. Before the sun got too intense, I sat on a bench overlooking the lake and made one of my better attempts at portraying water. 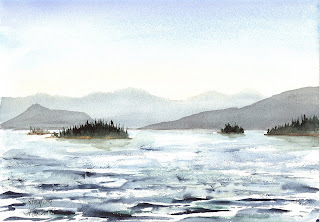 Then, as the sun rose higher and the day heated up considerably, I moved under the shade of some nearby pine trees, turned my back on the lake, and painted the charming old yellow (very yellow!) hotel itself. The rock I found to sit on was less than comfortable, so I worked much more quickly that usual. Everything went well until a chipmunk ran between my feet and the rock-a distance of maybe 10", and gave me quite a start! Janice,the water scene is very effective. Nice work! I also like the hotel. Looks like you were sitting above it - very interesting perspective. Oh, the joys of plein air painting -- I can imagine you got quite a surprise with the little fellow.